Today advertising noise is so strong and user loyalty to ads and slogans is so low that conventional marketing slowly but surely becomes helpless. If an opt in form isn’t working, it is perceived as a part of traditional stale advertising. Pop-ups have always been and remain a reliable tool for conversion growth. The thing is that they are rarely properly set and therefore, continue to be treated like standard advertising. There are several ways to deal with this, including the tool offered by Plerdy. Usually, ads tell users about the benefits of a product or service. Typical advertising suggests that the product (service) is suitable for every potential customer. An ordinary pop-up is similar to standard advertising. It offers, informs, and seduces forgetting about a dialogue. Personalization is not just a temporary trend, but a new marketing approach based on communication with users. No responsive layout. The mobile-first principle remains prevailing. The majority of users browse websites on their smartphones or tablets. If your page doesn’t have a responsive layout, the display of pop-ups will be distorted making them absolutely useless. Increased page load time. Users don’t like waiting. They will quickly leave a website if they don’t see its content within 5-7 seconds. The main reason for increased loading time after an opt in form is added are certain programming nuances. Nevertheless, today there are technical solutions for graphics files of any size. The period of the 90’s when websites didn’t include pages because of the problems with load speed elapsed. If the page has plenty of pop-ups, this, of course, affects its load speed. Yet the impact isn’t that critical if you connect pop-ups correctly using the modern programming methods. An opt in form doesn’t display on the page? Poor design. It’s not only about the design which doesn’t match the corporate style. It’s also about the wrong color combination which doesn’t create the necessary mood, old-fashioned fonts, the irritating size of the window and static composition. It is really noticeable, isn’t it? If you create an opt in form with the promise of discounts and gifts, contrasting design, the minimum of fields and buttons, and good navigation, you will make users complete the target action in a few seconds. A weak call to action and the absence of triggers. Be the first to know about new products, special offers, store events and more – this is the conversion triggering offer of Victoria’s Secret website. 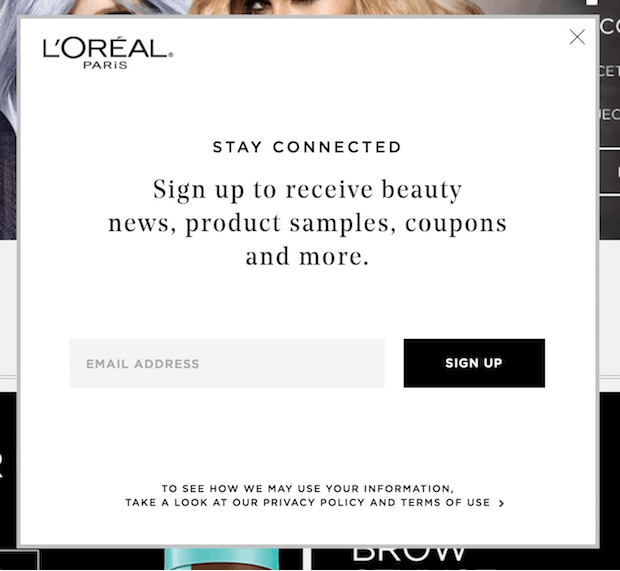 “Sign up to receive beauty news, product samples, coupons and more.” – the offer from L’Oréal. 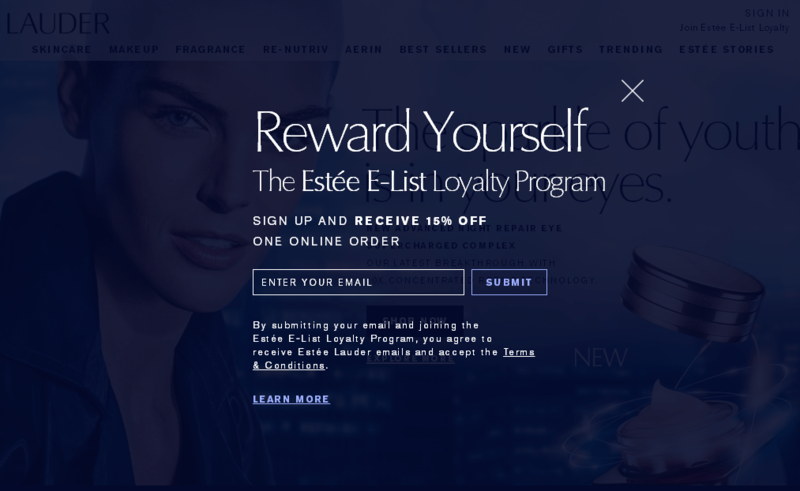 Both calls-to-action are great, but the pop-up of L’Oréal generates higher conversion. It has maximum motivation for users offering not only news and advertising offers but also samples, coupons, etc. L’Oréal bets on simplicity, clarity, and the maximum number of triggers. This is the path developing brands should take. They need to increase customer loyalty with the help of discounts, gifts, coupons, promotions. The call-to-action on the website of Victoria’s Secret works because millions of users know and love this brand. Will they be interested in events and articles about new products from the company they have never heard about? It is doubtful. Time, place, and motivation are three pillars of the effective content of any pop-up. Don’t write too much and mention your advantages. You should be either noticeable for your uniqueness or make an offer that will benefit users. For example, you shouldn’t display a welcome window before the page fully loads. Also, the offer to subscribe or receive a coupon should appear on the page of an article or blog. Show it no less than 10-15 seconds after users land on the main page. In this case, it will be timely, relevant, and related to the content. And a small pop-up requesting permission to define the user’s location in the right corner is a perfect way to set up personalization right away. Numerous fields. The simpler the form, the more likely the target action is. The overall rule of conversion suggests using 1-2 fields. However, in this respect, you should also evaluate the applicability of such a solution. For example, if you promote make-up, you can ask information about the user’s date of birth and name offering gifts in exchange (like Prostor and Watsons). No A/B testing. Most forms that generate 100% conversion are created in the process of experiments. A/B testing can be both internal (when people within the company choose the most appealing design of the opt in form) and standard (when different variants of pop-ups are placed and tracked using click heatmaps, Google Analytics, etc.). It is hard to define the relevant USP and select the native design right away. Conversion depends on the tiniest details, even one well-chosen word. Pushy display. For instance, on McDonald’s website, everything is perfectly thought-out. They display a small location window in the left part of the screen which appears about 5 seconds after users land on the page. It is closed traditionally by clicking on the Close icon in the corner. It is worth noting that after you close the form, it won’t appear when you visit the website again. Pushiness is evil, and you must avoid it interacting with your target audience. 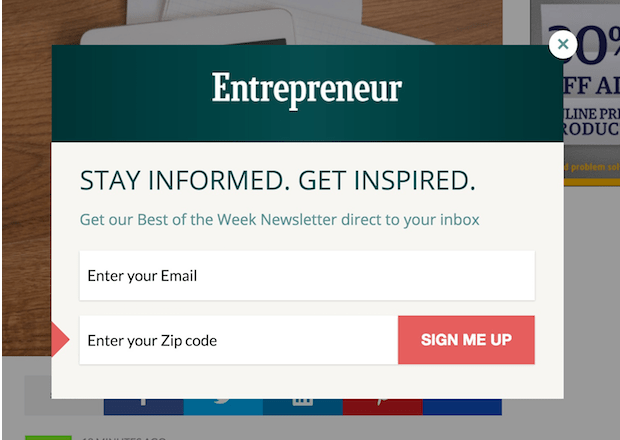 So place no more than 5 pop-ups and opt in forms on your website. Based on the research, it is recommended to use 3 different forms: welcoming, subscription, and scroll or thematic). Don’t show them frequently. Ideally, they should be displayed on an occasional basis, like on the website of one of the leading world’s fast food providers. Hidden navigation. No ways to get away. This could be a highly effective option, but it isn’t. Users want to know that they have a choice. The missing Close icon or Unsubscribe button irritate. Pinterest with their pushy pop-ups is probably the only example of the case when a resource can be popular with directive pop-ups. Leave the Close icon and add the Unsubscribe button. Yet at the same time, show users what they lose if they ignore the pop-up with the text near the Close/Unsubscribe button like No, I don’t want to stay updated, No, I don’t like saving, Thanks, I’m not ready to get discounts, etc. Remember that users must have a choice, but excessive freedom will make the placed pop-ups absolutely useless. If you implement the navigation and Unsubscribe button, you can make the Сlose button less noticeable, and vice versa. Wrong display condition. The page where the opt in form is shown greatly affects its conversion. For example, a welcome pop-up is only relevant on the main page. A subscription window generates better conversion when placed on the page of the particular article in a blog. In some cases (if there is no blog, the section of the article/news is rarely updated, but there is a regular newsletter), it can be effective on the main page. Scroll opt in forms are the most universal type of hooks. They don’t take a lot of space on a page and don’t distract too much from its content. Scroll pop-ups are great and relevant almost on every page. A lead-generating pop-up is a clear call-to-action with motivation, corporate design, navigation, the Close or Unsubscribe button, and the information about spam protection and confidentiality. Also, you should take into account the page where you place a pop-up, the frequency of its display, the number of fields, colors, text, graphics, and the location of the target action button. If you add a pop-up that will meet all these requirements, and adjust its work during the A/B testing, you can increase conversion to 86%, as Amazon, Colgate, CountryLiving, and Entrepreneur have already done.